i have just returned from a rather whirlwind trip to kuala lumpur; or, rather, have just almost recovered from return--spent all of saturday from dawn to pre-dawn sunday in transit. as i was there for a conference, i didn't really have time to explore KL properly, nor did i get to try all the food that i wanted, but not for lack of trying. i did get to meet with the fabulous boo_licious and her equally fabulous boo_liciousman on my first proper night there, but unfortunately the trials of travel, weak appetite, and the suprisingly effective words of paul mckenna made me lackluster company. i hope to one day return in better form and as a better guest. miss boo so kindly took me out of the touristy pocket i was trapped in for most of my stay, and into kampung baru, the oldest residential area in kl, a historically preserved area where modern development is strictly regulated. we went to CT Garden (CT Roses) for my first taste of nasi lemak. 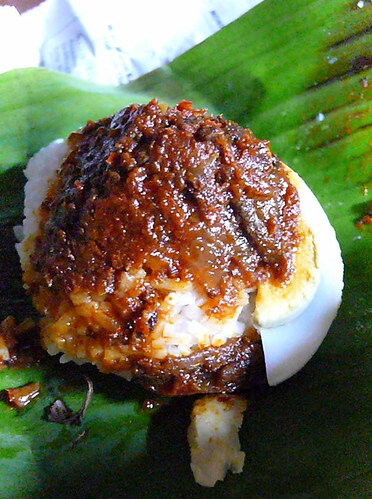 nasi lemak translates to 'rice in cream': white long grained rice cooked with rich coconut milk, which is scooped out, topped with sambal and a quarter of a hard boiled egg, then wrapped in banana leaf. it is eaten as is, or with any number of side dishes. it is a cheap, filling breakfast staple--but can be found throughout the day and is especially popular as post-club grub--and is said to be the (unofficial) national dish of malaysia. i let miss boo pick out the accompanying dishes, which were chicken livers and cow's lung (paru) marinated in soy sauce, lemongrass, and chilis then grilled, brown squid (dried cuttlefish which has been rehydrated) sautéed in a chili sauce, fried tempeh with ikan bilis and peanuts, fried chicken, and otak-otak, a blend of fish and chili paste grilled in a palm leaf. 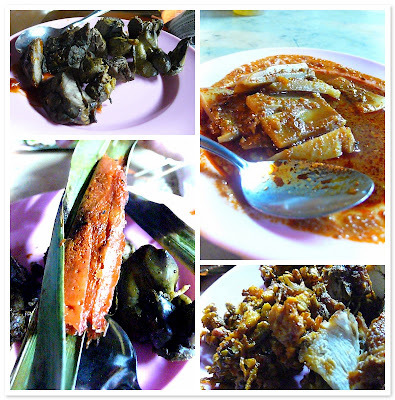 everything was very tasty and fresh, and i particularly enjoyed the otak-otak, which had the consistency of a firm mousse, and although made from mackerel and liberally spiced, was not overly assertive in any one flavour. also, the fried tempeh might be my favourite preparation of this soybean product, both complex in flavour and crunchiness. but truly the standouts for me were the lovely company, and the view of the sultan sulaiman sports club, and the petronas towers beyond. seriously, it's an advertiser's dream. 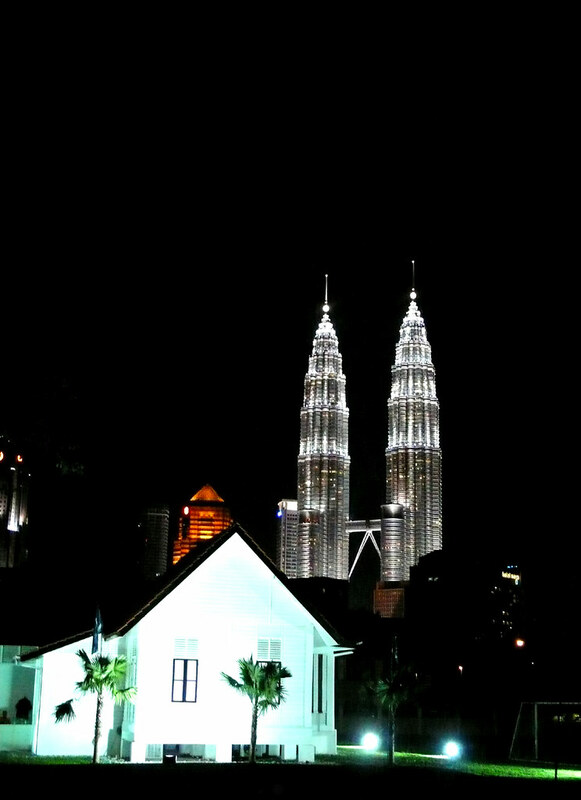 nasi lemak: 60 sens, grilled cow's lung: RM 2, view from the outdoor dining area: priceless. special thanks to MamaBok for facilitating the boo_licious/banana meetup. terima kasi! i'm going to kuala lumpur in a week or so; i've read dozens of malaysian food blogs, but pretty much nothing else. any suggestions? i'll be there for five days. 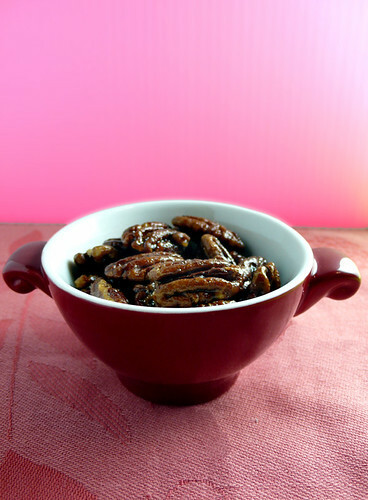 weekend treats for you to try: maple-glazed pecans, adapted from a "tartine" recipe. 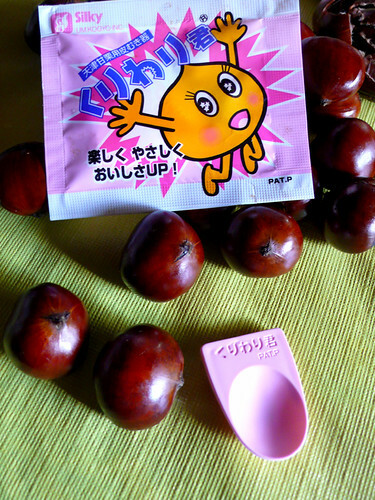 very lightly sweet, and salty too, which makes them v. addictive. so easy, cheaper and fresher than the stuff you can buy prepackaged. 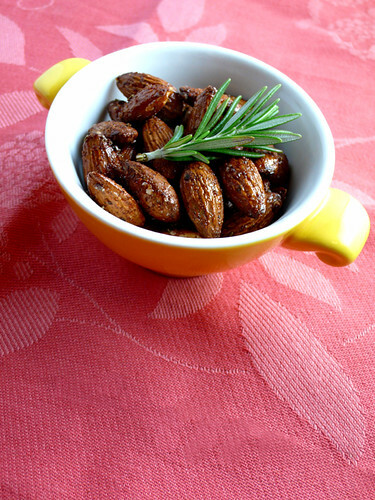 spiced herby almonds, also adapted from another "tartine" recipe. the ingredients are the more or less the same, the quantities just a suggestion, experimentation mandatory. the main diff in both these recipes is that i used a microwave for ease, convenience, and to appease said microwave of its reheating leftovers doldrums. the only problem in this is that i have no idea of how to tell you when the nuts are done. if you smell something burning, that's means they are really, really...done. times given in the recipes below are for a 1200w microwave, for nuts that are extra toasty, but not burnt. if you feel this is a far too foolish method (i don't blame you), roast them on a lined cookie sheet in a conventional oven at 400˚F for six to eight minutes, stirring occasionally. mix all ingredients well. microwave in a glass or ceramic dish, one or two cups at a time, on "high" for one minute. stir well. return to microwave for one minute. stir again. return to microwave for another 30 seconds to a minute, keeping a close nose for signs of burning. cool completely, stirring occasionally to break up the sticking pieces. cool completely. if they aren't crunchy enough or are too sticky for you, return 'em to the microwave for another minute zap. strip the leaves off the rosemary stalk. finely mince the thyme and rosemary. 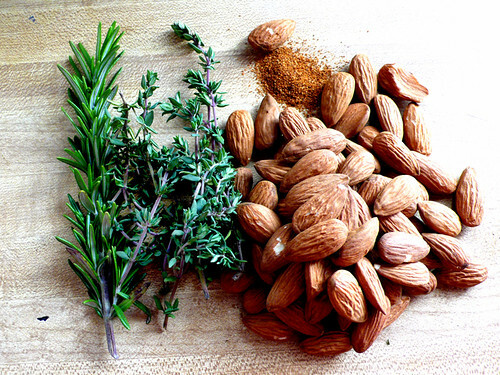 in a large bowl, mix all ingredients well. microwave in a glass or ceramic dish, one or two cups at a time, on "high" for one minute. stir well. return to microwave for one minute. stir again. return to microwave for another 30 seconds to a minute, keeping a close nose for signs of burning. cool completely, stirring occasionally to break up the sticking pieces. cool completely. if they aren't crunchy enough for you, return 'em to the microwave for another minute zap.